Cozzine is a company that works hard on designing House-Hold products to make people's life easier. All of our products are reached international quality standard, and are greatly appreciated in a variety of different markets throughout the world. If you are interested in any of our product or have any questions, feel free to contact us from Amazon. We are looking forward to design more useful product to all of our customer. Please read the included instruction manual carefully to avoid any misuse and keep it for future reference. When taking temperature from different parts of your body, it is normal to obtain a slight variation in the temperature readings. An ear (tympanic) temperature is usually 0.5-1°F (0.3-0.6°C) higher than an oral temperature. 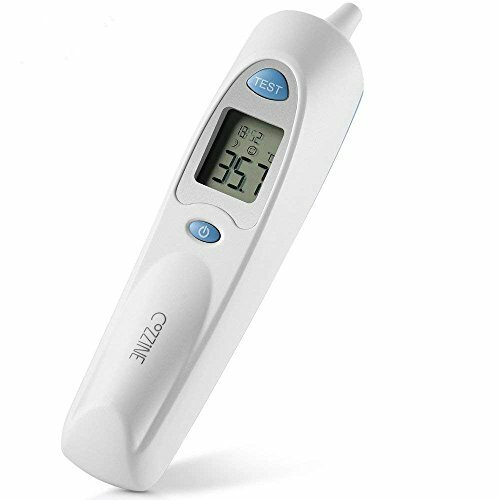 ♥SUPERIOR QUALITY AND TECHNOLOGY: Safe, effective, healthy, infrared ear thermometer provided with the most advanced infrared sensor technology and premium quality probe. Detection of in-ear temperature in seconds.Equipped with temperature measurement earmuffs to avoid cross-infection, prevent bacteria spreading, ensure a clean and professional measurement, in line with FDA testing standards. Suitable for infants, babies, kids, adults and elders of all age. ♥HIGH ACCURACY AND FEVER WARNING:Quick, easy and extremely accurate reading. With fever alarm alert, it only takes 2 seconds to test the temperature. When the body temperature exceeds 37.8, it will display a "crying face" symbol and warn you with 3 short beeps and a final long beep. Error: + / - 0.2 degrees Celsius, Fahrenheit + / - 0.4. ♥MEMORY STORAGE FUNCTION: Equipped with memory storage function, stores and recalls up to the latest 10 measurements, keep all reading data and create a measurements history, to be better track the changes of body temperature, understand the trend of the temperature, control the subtle changes in the body. ♥EASY! PRESS AND MEASURE: Equipped with only two buttons, immediate to use. Two function keys to allow you a simple and fast use, convenient and easy to understand. Power and energy saving: auto shut off after 10 seconds of inactivity. ♥BEST MATERIALS: Adopts advanced, innovative ABS material. Each infrared ear thermometer is carefully tested and quality is guaranteed, to ensure long service life and secure use. Do not soak underwater, the device is not waterproof. Simply disinfect the outer shell and probe. If you have any questions about this product by Cozzine, contact us by completing and submitting the form below. If you are looking for a specif part number, please include it with your message.